The Lancaster Shopping Centre, just after opening. Image: Archives of Ottawa, Item CA004606, June 13, 1954. On April 28, 1954, residents of the rapidly developing part of Nepean Township known as City View were welcomed to the grand opening of the Lancaster Shopping Centre. Constructed by subdivider and homebuilder William Lancaster and designed by architect Norman Sherriff, the small plaza opened with Hyde’s IGA Foodliner, Tom Reith’s Hardware, the Elm Grove Pharmacy, and a post office.1Ottawa Journal, April 28, 1954, p. 12. It is felt that the center will provide the answer to the difficulties residents of the many new housing developments in this area have been experiencing. It will serve such locations as St. Claire Gardens, Meadowlands, Pine Glen, Britannia Heights, Courtland Park, as well as others and the lack of parking difficulties is expected to draw shoppers from even further. “‘Open House’ Tonight At City View Center,” Ottawa Citizen, April 28, 1954, p. 13. Before the storm: this aerial from 1945 depicts the rural nature of the area. Image: NAPL Flight A9618, Photo 96. October 30, 1945. Nepean’s first suburban development boom was lead by larger numbers of small subdividers and builders. The much larger tract builders would come later, during the 1960s.5Elliott, Chapter 8. Never a prolific builder in his own right, Lancaster made passing attempts to marry his shopping plaza to one of his subdivisions, which he named Elmgrove. Aside from a few scattered references found in real estate ads and it being the name of the Payette’s pharmacy in the plaza, “Elmgrove” never did garner wide adoption.6See Ottawa Journal, February 27, 1954, p. 25; March 1, 1954, p. 28; March 19, 1954, p. 35; April 28, 1954, p. 12; May 1, 1954, p. 24; January 21, 1955, p. 28. 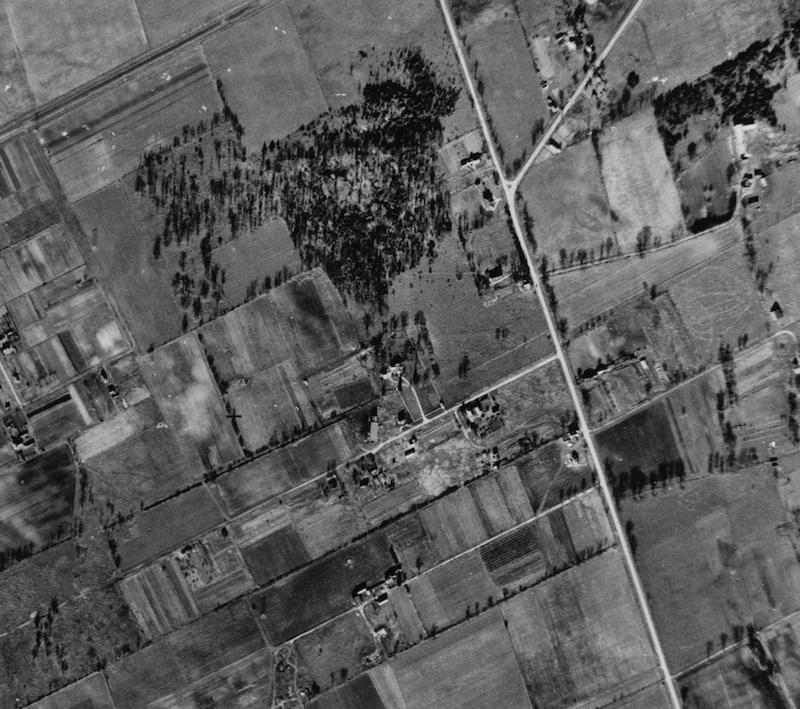 Detail of the area, as it stood in 1957. The Lancaster Shopping Centre is located along Merivale, in front of Kerry Crescent. Image: Federal District Commission, “The National Capital – Ottawa & Environs” July 1957. Nevertheless, as the first in a series of many shopping plazas that would come to line Merivale, the William Lancaster’s briefly shone as a waypoint in a very hectic suburban development situation as well as served as something of a commercial anchor for the area. As a larger story for another day: that anchor proved considerable. Nepean Township (and City View) did not have Ottawa’s “early closing” bylaw, rendering that much more seductive the call of large suburban stores.7It’s a much longer story, but see “CS Wants One Night Shopping,” Ottawa Journal, July 6, 1951, p. 3; “Proceeding Through Injunction: Billings Bridge Stores Face Early Closing Bylaw Test, Ottawa Journal, November 23, 1955, pp. 1-2; “Customers Throng Shopping Centres as Police Watch,” Ottawa Journal, December 3, 1955, pp. 1-2; “New Moves Made in Ottawa On Night Shopping Bylaws,” Ottawa Journal, March 2, 1956, p. 2; “Await Result Early Closing Case,” Ottawa Journal, May 7, 1958, p. 5; “Night Shopping Inevitable Here,” Ottawa Journal, July 8, 1958, p. 17; “Evening Buying Opposed, ” Ottawa Citizen, November 15, 1961, p. 1; Ben Dworkin. “Night Shopping Might Be Forced Upon Retailers,” Ottawa Citizen, November 15, 1961, p. 9; David Hill. “Future of Joint Police Force Doubtful,” Ottawa Citizen, July 31, 1963, p. 30; David Smithers. “New battle builds up over night shopping,” Ottawa Citizen, August 1, 1968, p. 17; “Wednesday night extension of shopping hours in Ottawa,” Ottawa Citizen, May 24, 1983, p. 9; Doug Yonson. “Late-night shopping an issue – again,” Ottawa Citizen, August 27, 1985, p. D1. The Lancaster Shopping Centre as it appears today(ish). A series of fires through the 1960s and expansions have resulted in a considerably expanded plaza. Image: Google Maps, 2014. 1. ↥ Ottawa Journal, April 28, 1954, p. 12. 2. ↥ This new “urban” population sought to have the right to levy its own taxes and pass bylaws. 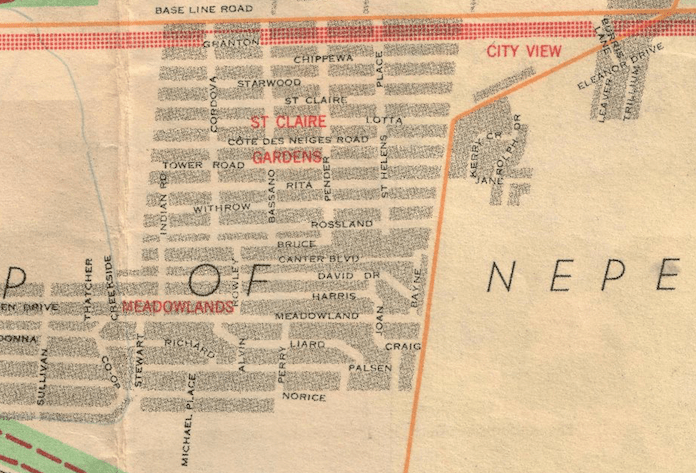 Of Nepean Township, City View was to encompass Meadowlands, St. Claire Gardens, Orchard Park, and Lancaster’s subdivision. It became official on July 1, 1955 and had a population of 2,500. See “City View To Become Police Village,” Ottawa Journal, March 23, 1955, p. 3; “City View Area Plans to Form Police Village,” Ottawa Journal, November 11, 1954, p. 44; Ottawa Journal, June 29, 1955, p. 6. 3. ↥ St. Claire Gardens had been originally subdivided in 1913 but with a few individual exceptions, remained unbuilt upon until this time. See Bruce S. Elliott. The City Beyond. Nepean: City of Nepean, p. 267. 4. ↥ By the end of 1953, more than 1,000 homes had been constructed in Nepean doubling the population. A third of that was in 1953 alone. Ibid. 5. ↥ Elliott, Chapter 8. 6. ↥ See Ottawa Journal, February 27, 1954, p. 25; March 1, 1954, p. 28; March 19, 1954, p. 35; April 28, 1954, p. 12; May 1, 1954, p. 24; January 21, 1955, p. 28. 7. ↥ It’s a much longer story, but see “CS Wants One Night Shopping,” Ottawa Journal, July 6, 1951, p. 3; “Proceeding Through Injunction: Billings Bridge Stores Face Early Closing Bylaw Test, Ottawa Journal, November 23, 1955, pp. 1-2; “Customers Throng Shopping Centres as Police Watch,” Ottawa Journal, December 3, 1955, pp. 1-2; “New Moves Made in Ottawa On Night Shopping Bylaws,” Ottawa Journal, March 2, 1956, p. 2; “Await Result Early Closing Case,” Ottawa Journal, May 7, 1958, p. 5; “Night Shopping Inevitable Here,” Ottawa Journal, July 8, 1958, p. 17; “Evening Buying Opposed, ” Ottawa Citizen, November 15, 1961, p. 1; Ben Dworkin. “Night Shopping Might Be Forced Upon Retailers,” Ottawa Citizen, November 15, 1961, p. 9; David Hill. “Future of Joint Police Force Doubtful,” Ottawa Citizen, July 31, 1963, p. 30; David Smithers. “New battle builds up over night shopping,” Ottawa Citizen, August 1, 1968, p. 17; “Wednesday night extension of shopping hours in Ottawa,” Ottawa Citizen, May 24, 1983, p. 9; Doug Yonson. “Late-night shopping an issue – again,” Ottawa Citizen, August 27, 1985, p. D1.